The Research Center for Japanese Garden Art and Historical Heritage is pleased to announce the 19th annual English language intensive course in the history, design theory, landscape ecology, and practice of Japanese Garden. We have been running the Seminar successfully for 19 years, and have been joined by more than 437 participants from all over the world – from Singapore to Mexico, Germany to the US. The international character of the participants has over the years increasingly stimulated the global character and contents of our teaching, making the Seminar a full and rewarding event for everyone involved, including the staff of the Center. The program is designed in the context of the Graduate School of the Kyoto University of Art and Design. The Seminar leaves ample room for an individual learning experience for each participant and is fully academic at the same time. If you have taken part in an Intensive Seminar with us previously, you are welcome to apply once more for the Intensive Seminar Plus. The two-week program offers serious students from abroad a number of unique opportunities to study Japanese garden. Fundamental to the academic learning experience of the seminar is the site. 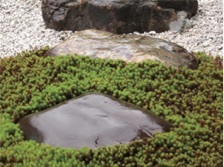 Apart from on-site lectures in gardens - some not open to the public - the seminar will also include on-site sessions with professional specialists to experience, first hand, the techniques and processes of Japanese garden design and construction. Some days will be divided between site visits and lectures on campus, but there will be several all-day excursions as well. An outstanding feature of the course is the International Symposium halfway through the course. Top researchers will give presentations, and there is a chance for you as a participant to tell us about your experiences. We will ask you to contact us beforehand if you feel you want to share your experiences with us for the symposium. A more informal colloquium is also part of the seminar. Plenty of resources (documentations) will be provided by the Center as well as our list of recommended famous gardens and sites in and around Kyoto for you to visit, for which some days are reserved. Graduate students from the University, though limited in number, will be available to guide you on these days. In order to provide maximum personal attention, we strive for a group limited to not more than 25 students.